A new design could soon see the advent of home-use 3D printers that can make objects out of metal. While some lucky engineers get to use industrial additive manufacture machines in research environments, many are stuck making things out of plastic with their user-level 3D printers. However, a new low-cost device developed by Michigan Technological University could add to that list; hammers, brake drums, or really any metal object imaginable. Detailed plans, software and firmware have all been released open-source, so that anyone can use them to make their own metal 3D printer. Research Joshue pearce says the project is still just that, a work in progress, but he believes that once people start tinkering with their own units advances will come quickly. “Similar to the incredible churn in innovation witnessed with open-sourcing of the first RepRap plastic 3D printers, I anticipate rapid progress when the maker community gets their hands on it,” says Pearce, an associate professor of materials science and engineering/electrical and computer engineering. 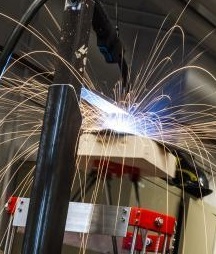 Using just a few hundred dollars worth of materials, a small commercial MIG welder and an open-source microcontroller, the team built a printer capable of laying down thin layers of steel to form complex geometric objects. Commercial printers which can work in a range of metals including titanium are available, but cost about half a million dollars for the most basic unit. Pearce says the advantages of additive manufacture will change the world. “I really don't know if we are mature enough to handle it,” he added cautiously. More details are described in “A Low-Cost, Open-Source Metal 3-D Printer,” to be published soon in IEEE Access.